The Bosch Multiplexer has been discontinued. No direct replacement is available. Incorporates advanced circuitry and expanded memory with improved color sampling and processing to produce high quality, true-to-life color video images. 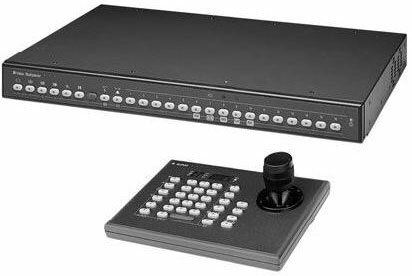 System4 intelligently provides a multifunction system capable of handling up to 9 or 16 camera inputs with switching and multiplexer control, pan/tilt/zoom, and VCR control in one compact unit. The advanced features of System4 are accessible through the optional remote keyboards. The System4 remote keyboards control all primary functions of any selected Bosch VCR. Up to 30 System4 units and 30 VCRs can be programmed and controlled by one keyboard. The system's user-friendly controls allow fast and easy programming and operation. Help screens provide explanation and instruction, guiding operators step-by-step through the setup process. All System4 models provide digital motion detection, ensuring that cameras with motion present become the priority for recording.